Some people argue that the Church doesn’t officially teach that we believe that man can become like God (sometimes termed deification or theosis). Such a claim is simply untrue. I clearly remember teaching the doctrine as a missionary; it was on the very first page of the first discussion. Most Christians already believe that God is our Father, and that we are His children, and as such we can become like Him. Indeed, we should strive to become like Him. Some criticize the Church because of one doctrine we hold most dear, which is exaltation. This has also been referred to at different times and places as godhood, deification, divinization, taking upon the divine nature, making divine, or theosis (also theiosis, theopoiesis, theōsis; from the Greek Θέωσις). It is, in its most basic description, that man may become like God. Many of our fellow Christians see this as the ultimate blasphemy and heresy. How could man ever become like God? Why would he want to do so? Doesn’t this go against everything God has taught through his holy word? The reality is that this concept has been a fundamental part of Christian thought since early Christianity, found throughout the Bible and in early Christian writings. Unfortunately, this Christian teaching has been largely lost over the ages. God restored the doctrine of exaltation through the Prophet Joseph Smith, as part of the restoration of the church of Jesus Christ. Some have thought that Joseph’s teaching of this concept was a rather late invention of the prophet, near the end of his life. However, the doctrine can be found even in the Book of Mormon, which was published before the church was formally organized. I recently came across two great articles that were published that discuss this topic. Daniel C. Peterson, “Defending the Faith: Exaltation isn’t a new doctrine,” Deseret News, 8 November 2012. Peterson shows in this article how the doctrine of exaltation, or theosis, was not a late revelation in the restoration of the Church, but is found throughout the teachings of Joseph Smith. Elder Tad R. Callister, Presidency of the Seventy, “Our Identity and Our Destiny,” BYU Devotional Address, Campus Education Week, 14 August 2012. Elder Callister fantastically presents five witnesses of the truth of the doctrine of deification: the testimony of the scriptures, the witness of the early Christian writers, the wisdom of poets and authors, the power of logic, and the voice of history. I highly recommend these two articles. If you want even further in-depth study, then I also suggest William J. Hamblin’s excellent recent publication in the Interpreter journal, “‘I Have Revealed Your Name’: The Hidden Temple in John 17,” where Hamblin discusses the chapter of John 17 in fine detail, revealing the strong temple concepts embedded in the text, including theosis. He also includes an appendix with a bibliography of twenty-three recent scholars’ books on the subject of deification, published just in the last decade, all of them Christian, that you may dive into to learn more about this very Christian teaching. Above is a film portrayal of the prayer of Jesus from John 17, which is a conclusion of his Last Discourse given to his disciples on the eve of the Passover. This discourse stretches from John 13 through chapter 17, with the prayer at the end, comprising chapter 17. This scene comes from a 2003 film entitled “The Gospel of John,” and takes it’s text from the American Bible Society‘s Good News Bible, which loses some of the intricate meaning in Christ’s words, but otherwise I think it is well done. I’m looking forward to the Church’s version when it is added to the collection of Bible Videos, which will use the King James Version directly (here you can see the Last Supper, which is the beginning of the discourse from John 13). Jordanian Lead Plates: Authentic or Forgery? I’ve posted about the discovery of the Jordanian lead plates two times now, and have been following the news stories closely over the last few days. As I have said, extensive investigation must still be done to verify the authenticity of the find, and determine facts such as precise dating, who made them, and their meaning. Unfortunately, the details keep getting stranger and stranger. I’m usually one who likes to believe. Joseph Smith once taught, “I never hear of a man being damned for believing too much; but they are damned for unbelief.” But the facts seem to be stacking up against this one. UPDATE: See the latest updates about this discovery at Jordanian Lead Plates: Authentic or Forgery? 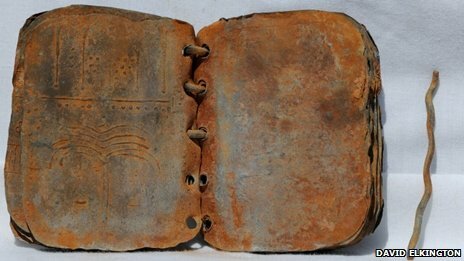 A few days ago we wrote about an interesting discovery of ancient sealed metal plates that were found within the last few years in Jordan, and are starting to create a stir among archeologists. The BBC News religious affairs correspondent Robert Pigott just published more interesting details, and photos, of the plates, in a report entitled “Jordan battles to regain ‘priceless’ Christian relics“. The BBC also includes a set of 7 more detailed photos here.